Glasses have played an important role in many sci-fi films over the years helping people to fight crime, look cool or simply to see straight. Here is a list of just five of my favourite ones! 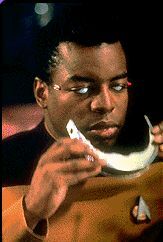 Lieutenant Commander La Forge was of course one of the main characters from the television series, Star Trek: The Next Generation and he served as helmsman of the USS Enterprise-D for the first season and for the rest of the shows run as chief engineer. He is famous for his trademark VISOR which enabled him to see by directing interacting with his brain and enabling him to see much of the electromagnetic spectrum. 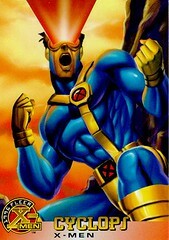 Scott Summers is the very first X-Man to be recruited by Charles Xavier and one of the first original five X-Men. Scott starts to suffer with severe headaches in his teens and when he runs away from an orphanage his mutant powers are unleashed for the first time and he nearly kills several people when his beams hit a crane. Fortunately this is where Xavier comes in and he develops a device to be put over his eyes so that Cyclops can control his optic force beams, hence the birth of the Cyclops. 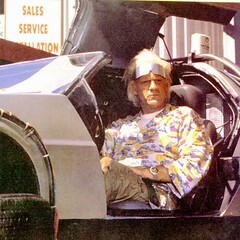 Okay so this crazy doc doesnâ€™t wear his glasses all of the time but the glasses that Doc Brown wears in the year 2015 are pretty awesome. Although it has never really been revealed what these ultra cool silver glasses do, it would seem that they somehow stream information to the eyes of the wearer.Â Although this isnâ€™t likely to happen by 2015 it is still a possibility of the future, as are flying cars I guess! 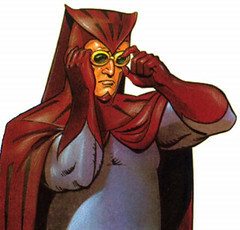 The Nite Owl II is of course Daniel Dreiberg who is a retired, out of shape superhero who uses owl-themed gadgets. Many people have compared the character to Batman but it is noted that his normal everyday look is a lot like a middle aged Clark Kent. The glasses that he wears as a superhero allow him to see in the dark in exactly the same way a real owl would but his everyday glasses are of course just very geeky looking glasses perhaps in an attempt to hide his identity. The ultimate machine here and although the black sunglasses played a vital role in the first movie it would seem that in the second movie it was the one where we really started to see how important they were to this reprogrammed robot from the 800 series as he seems to get pretty damn annoyed when they are taken from him. I think there have been many more that I have may fotgotten to add – drop us some ideas and links in the comments and we will make sure that we add them on! This is a guest post by Ryan, a keen blogger working for a company that sell glasses and specialise in prescription glasses . Sci-fi movies have to be up there in his favourite genre of movies and it is surprising how many of the characters have worn glasses. Sunglasses that let you see through the subliminal propoganda and the guises of your alien overlords. Goggles that let you see the evidence of paranormal activity. Goggles that protect Riddick’s preternatural nightvision from the brightness. Glasses that allow you to see ghosts. & I must point out the goggles of Dr. Horrible – as they epitomize the traditional mad scientist genre. all good choices – this post was a guest post, and I will def do a follow up. AND include your choices in there with credit.